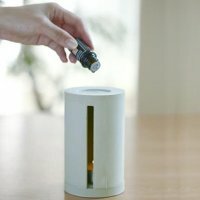 Please put a tea candle light in the middle of the part at the bottom of the aroma pot, then place the main part above it and in the end place the small plate on top of the main part. By putting some aroma oil or essence on the plate at the top of the aroma pot, the diatomaceous earth will absorb the fluid instantly and due to the heat of the candle positioned below you can enjoy the aroma immediately. 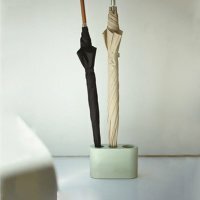 With the water absorbing properties of diatomaceous earth, the stand absorbs water drops from umbrellas and takes up minimal space. Cement is used for the exterior.